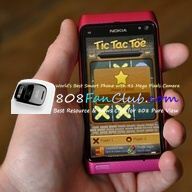 Put away your pencil and paper – now you can play Tic Tac Toe on your Nokia Phone. Tic Tac Toe supports one player and two player gameplay, so you can play against another human or against your phone. The AI for one player mode includes three difficulty levels,two mode: Classic mode(Tic Tac Toe) and 4 in String game. Compatible with S^3 / Anna / Belle Smart Phones.